The RC Vought Corsair. 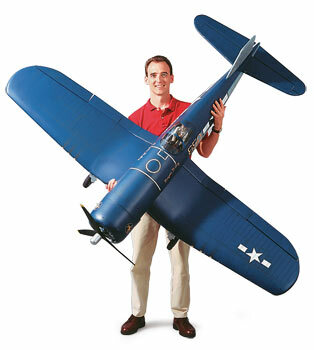 Top Flite's 60 size and Giant Scale RC Airplane Kits. The RC Vought Corsair can be built from the Top Flite RC airplane kits and will be an absorbing build and will fly very well. This kit has been available since 1991 and has recently been updated, to include the latest techniques. Construction is of balsa and ply and the original prototype was covered in Monokote. All the parts are die cut and are to Top Flite's usual high standard. This is not a beginners airplane and requires some basic building experience and also some flying skills are necessary for success. If this model appeals to you, then I strongly suggest you take a look at the Top Flite manual. This will give you a good idea as to the construction details and if you feel capable of building this RC Vought Corsair. Many scale details are available for this RC Vought Corsair and a look at the manuals, for these details, is always a good idea. Top Flite have an excellent scale cockpit interior available as well as a dummy radial engine. Instructions are given in the manual for building the scale flaps, which I would recommend. This feature makes landings a delight and definitely adds to the scale realism. The Cockpit Interior Kit F4U RC Vought Corsair can be found on this Amazon page. Another scale feature that is well worth the effort, is a set of Robart retracts. A WW2 warbird does not look right, flying around, with the wheels down! An excellent choice of the many RC plane engines available, for the RC Vought Corsair, is the Thunder Tiger Pro 61, 2-stroke. A 2-stroke is light and powerful and the Thunder Tiger is very well built and should last a lifetime. I notice in the manual, that Top Flite also recommend a 120 4-stroke for this model. I think a 120 is a bit too much and I would limit a 4-stroke to a 91 or a 100, at the most. As the photo shows, this is definitely a large scale model aircraft! Built from die cut balsa and ply parts this model builds up very well from the CAD designed plans. This kit has been around for a fair time now, so many of the "bugs" will have been worked out. Please be aware that this is by no means an ARF and even though Top Flite has done a great job in engineering this kit, it is a major build project! Please note that the engines recommended by Top Flite are no longer available. 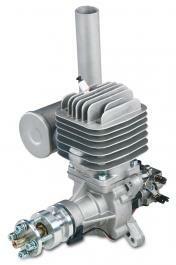 I would suggest that a modern RC gas engine of about 50 cc would be a good choice. 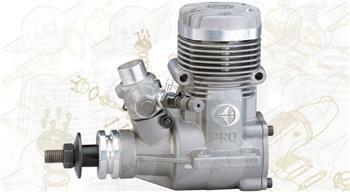 The photo shows the DLE-55cc gasoline engine. This engine comes complete with a Walbro carb and electronic ignition. This amazon link will enable you to buy the Robart retracts for this RC Corsair. Do not even think of building this model, without a decent set of retracts! Name: Top Flite 60 size Corsair. Engines req'd: 2-stroke .61-.90 cu.in. or 4-stroke .91-1.20 cu.in. Name: Top Flite Giant scale Corsair.